The U.S. suffered its worst natural catastrophe to date when a massive earthquake hit San Francisco in April 1906. What the shaking earth did not destroy, ravaging fires in the quake’s aftermath did. Coming at a time when dangerous irregularities in the country’s packing plants were uncovered in Upton Sinclair’s landmark book, The Jungle, it was obvious that the American infrastructure was unconsolidated and unprepared for significant disruptions. 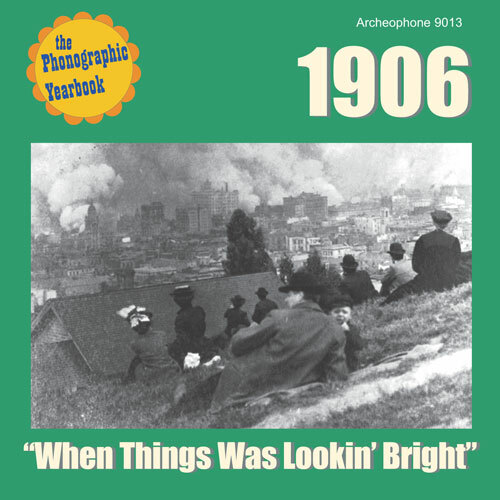 Archeophone’s Phonographic Yearbook, 1906: “When Things Was Lookin’ Bright,” shines a light on these events and provides a 27-selection soundtrack to the historical moment. Many of the biggest hits of 1906 are also prominent members of the great American songbook, and none more so than Bert Williams’ moaning lament, “Nobody.” Our number-one all-time most requested song, “Nobody” perfectly sums up the feeling of helplessness felt by the victims of cruel fortune. More optimistically, “Wait ’Till the Sun Shines, Nellie” was so popular that major hit versions of it were scored by both Byron G. Harlan and Harry Tally. Similarly, the stirring ballad, “Love Me and the World Is Mine” was a hit for both Henry Burr and Albert Campbell–two of the early industry’s most versatile tenors who would later form a duet partnership. By 1906 it was indisputable: Billy Murray was the first genuine hit personality of the fledgling acoustic-era industry. He had scored big hits already, but now he added huge pieces to his repertoire: Lew Dockstader’s “Everybody Works but Father,” the cowboy-themed “Cheyenne,” and George M. Cohan’s controversial masterpiece, “The Grand Old Rag.” Eager to capitalize on Murray’s success, Victor paired him up with their best vocal ensemble, the Haydn Quartet, for “Waltz Me Around Again Willie” to build on the franchise. Our 1906 Phonographic Yearbook captures the hopeful feeling of the times, but the historical moment of San Francisco’s April 1906 agony is especially etched into the beautifully recorded aria of “Forza del Destino—Solenne in quest’ ora” by Enrico Caruso and Antonio Scotti. The two opera stars had recorded it in Camden only weeks before they performed in Carmen at the Grand Opera House in San Francisco the night before the earthquake struck. A terrified Caruso swore he would never return to the Bay city–and he kept his promise. 1906: "When Things Was Lookin\' Bright"